The Final Salute - Kindle edition by Kathleen M. Rodgers. Literature & Fiction Kindle eBooks @ Amazon.com. Matchbook Price: $0.99 What's this? At a small air base in Louisiana, family man and seasoned fighter pilot, Tuck Westerfield's life could literally crash down around him. In this business of flying fighter jets, the odds of staying alive are stacked against him. Haunted by the memories of dead friends killed in air mishaps, this Vietnam vet and father of three must deal with a devious commander, an animal-crazed neighbor, whose husband hates pilots, a beautiful, but suspicious wife and a rebellious teenage daughter. The last thing he needs is another war. But when Iraq invades Kuwait in the middle of a muggy Louisiana summer, duty calls. Tuck and the other pilots in his squadron head to the Middle East. Back in Louisiana, Gina Westerfield and other military wives learn that war is hell on the home front, too. Later, when tragedy strikes, everyone at Beauregard Air Force Base must pull together and live on or forever be consumed with grief. “A realistic yet heartwarming and reaffirming assessment of life and love and dedication by the very people who guard our own lives.” Parris Afton Bonds, New York Times bestselling author & cofounder of Romance Writers of America. Kathleen M. Rodgers is a former frequent contributor to Family Circle Magazine, Military Times, and many other publications. Her work has been featured in several anthologies, and three of her aviation themed poems were featured in a special exhibit at the Cradle of Aviation Museum on Long Island, New York. Her debut novel, The Final Salute, enjoyed national coverage in USA Today, The Associated Press, and Military Times. Johnnie Come Lately and Seven Wings to Glory (Camel Press) will be released from Thorndike Press in hardcover large print library editions early 2018. Currently working on her fourth novel, her future work is represented by Diane Nine of Nine Speakers, Inc. For more information, go to kathleenmrodgers.com. I have started to read this book two times..didn't get any further than a few lines into the second chapter..why? The title told me someone I liked would die. Good characters in a good book become family & those close to them like extended family. Third times a charm. I started reading again & absolutely could not put it down. Ahhh ...the military. The political "stuff." The pomp, the bluster of men marching over each other to reach the next promotion. The families left "waiting" until the loved one comes home again..or not! War has been..since the beginning of time & will be...until the end of same. Ms Rodgers put it all in her book..& does a fine job of it. The deceit of some, the honor of others, the families, the friendships, the human squabbles, laughter, tears, life, birth & death. It's all here. Well done Ms Rodgers. Because of the language in the first few chapters I wasn’t going to finish this book. But, I continued reading (the bad language quieted down) the book. Pretty soon I couldn’t put it down. It’s true to military life and peoples’ lives. I cried several times. The characters seemed real. I’m wondering if this is a biography, or at least based on real people. I’m recommending the book to my retired Navy sons and their wives and another friend who learned to fly young cropdusting, joined the army, flew helicopters in Vietnam, and is a retired pilot with American Airlines. 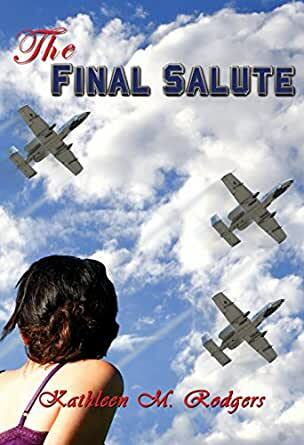 The Final Salute by Kathleen M. Rodgers has received over twenty reviews to date (on Amazon.com), the majority of which were written by military folks, many of which are connected with the Air Force. This reviewer is going to come from the perspective of someone who has not served in the military, and has not had any connection to the Air Force. The Final Salute takes readers into the world of Air Force fighter pilots. This is a life where the pilots don't know from day to day whether they will make it home to be with their families. They are haunted by the memories of dead friends, lost in war or in air mishaps, and must go on living their daily lives with all that comes their way. The story is compelling and pulls the reader into the life of Tuck Westerfield and his family. He is a Vietnam vet serving at a small air base in Louisiana. The author does a superb job of creating the characters all around Tuck to make a very believable story, one that creates tension between people, which makes for a great read. Tuck, along with the other pilots in his squadron are called into battle again when Iraq invades Kuwait. Tragedy strikes, the final salute is offered, and this is when they again realize that they "must pull together and live on or forever be consumed with grief." Kathleen Rodgers has lived her life being the wife of a fighter pilot. She dedicated this book to her husband, Tom ("whose ghosts first inspired this story"), and "in memory of fallen friends, too numerous to mention here"). Be sure to read the poem "TAPS" at the beginning of the book, for it will make this story a reality, as it was written by the late Mrs. Maryellen Husson after her first husband, Captain Roy Westerfield, was killed in a plane crash in 1980. After reading the poem, readers will see that The Final Salute is a very meaningful title for Kathleen Rodger's book. This is a well-written book and readers beyond the Air Force will appreciate the story. This reviewer is looking forward to more books written by Ms. Rodgers. Actually, this rating is for 4.8 stars. It was an EXCELLENT book, with just a few things that marred it, like furniture marks on newly-painted walls. While this book purports to be about pilots and flying, it is actually at least an equal proportion about pilot's wives and the military community. The author obviously has quite a bit of experience in this area, and the story is very well told. The actual writing style was quite good. Very easy to read, and to get immersed in. There were only a few errors that put some hiccups in an otherwise very enjoyable read. Page 10 (Chapter 2) - "...the air was too thick to breath." Page 59 (Chapter 5) - "Westerfield was taught ... never to talked back to a superior officer." There are more, and like these, the errors aren't horrible. They're just enough to put a pothole in an otherwise fairly smooth read. BOTTOM LINE: I enjoyed the book, and would probably be willing to read another from the same author.